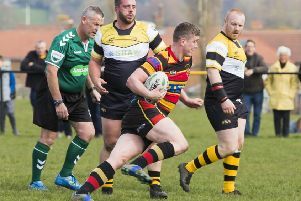 Heath paid the price for a disastrous seven minute spell as they lost their penultimate Yorkshire One match of the season by 32-11 at Bridlington on Saturday. They were only 15-11 down with 12 minutes to go and pressing for the lead but then lost concentration and discipline and the home side pulled away. It started well for the Halifax side, who had Chris Piper and Mark Puttick back in the starting line up and Rondene Johnson, Alex McFadden and Mark Sales on the bench as coach Dave Harrison kept faith with the players who scraped a win over West Park. Heath went 5-0 up after two minutes, Ezra Hinchliffe releasing Cameron Ramsden and Si Brown for Callum Harriet-Brown to go over in the corner. The conversion attempt failed as Heath were playing into a strong wind. Bridlington could not cope with the fast pace, No 8 Josh White driving his pack forward and scrum half Dom Walsh doing all he could to get the backs moving. Gradually the home side came into it but Heath were determined to shut them out with Matt Beasty and Fergus Marsden winning good line out ball and terrier-like tackling from Peter Birkett and Howard Hanks. Piper, Puttick and Olly Cook were carrying the ball well and it wasn’t until the 30th minute that Bridlington got on the scoreboard with a penalty for 3-5. This was quickly cancelled out from the restart when Hinchliffe converted a penalty. Bridlington’s fly half Matiu Welch was becoming a danger and a clever, slick pass saw full back Jack Arthur go in under the posts for the hosts to lead 10-8 at half time. A surging run from Josh White on 42 minutes led to Hinchliffe linking up with Sam Pollard and Jack Crabtree, only to see Harriet-Brown hauled into touch a few metres from the try line. Bridlington came back and from a quick tap penalty the home side scored to lead 15-8 against the run of play on 52 minutes. Good work from Piper and Birkett led to a penalty kicked by Hinchliffe. The visitors had a let off as Bridlington missed an easy opportunity for a try but from a deep drop out Bridlington waltzed through nonexistent Heath defence for Welch to score a converted try under the posts. Further tries followed from Welch and Davies and with five minutes remaining the game had gone.